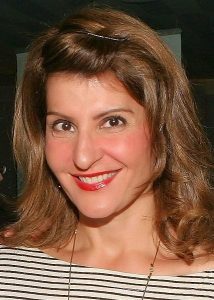 Photo: Nia Vardalos, a Canadian-American actress of Greek descent. Photo by Canadian Film Centre/Jesse Grant/WireImage accessed on Wikimedia Commons. Greeks, also known as the Hellenes, are a nation and ethnic group native to Greece, Cyprus and other regions. Many ethnically Greek people live in Turkey, called in antiquity Asia Minor. They also form a significant diaspora, with Greek communities established around the world. 1) The Greek population data represents DNA samples from 143 unrelated individuals living in Greece. Samples were obtained by the Faculty of Medicine for the Institute of Legal Medicine, at the University of Santiago de Compostela in Spain; and by the DNA Analysis Laboratory for the Legal Medicine Dept. of Athens. Assistance was provided by the Xunta de Galicia –the collective decision-making body for Galicia, a region of northwestern Spain– and by Galicia’s Ministry of Science and Technology. 2) The Greek population data represents DNA samples from 205 unrelated Greek individuals typed at the Legal Medicine Department of Athens. 3) The Greek – Northern population data represents DNA samples from 318 unrelated Greeks from the northern region of Greece who were sampled in 2005 by the Aristotle University of Thessaloniki in Greece. 4) The Greek population data represents DNA samples from 208 randomly selected individuals from Greece. The Greek People’s Physical Characteristics.